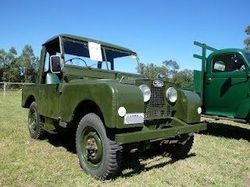 The 2018 Muster will again feature Land Rovers, from the Series 1 to current vehicles. The Land Rover, like the Fergie, was an innovative product of a country needing to recover from the destruction of World War II. It was envisaged that the Land Rover could one day function as a workhorse, and the next day be the transport to town. The Rover Company and the Standard Motor Company were both located in the industrial West British Midlands. All Land Rovers are welcome, including modified and project-specific ones, and we hope to have a diverse display of them. The Landies can participate in the Grand Parade and the Tractor Treks. If there is sufficient demand, there will also be a Land Rover run over local infrequently used roads. If you have a Land Rover that you would like to display, please use the online form on the registration form below, or download a copy of the form from that page. If you have trouble, just let us know and we can email or post you one. Our postal address is Grey Fergie Tractor Muster, PO Box TE20, Bendemeer NSW 2355, our email address is lr@greyfergietractormuster.com.au and our phone number is 0468 FERGIE (0468 337443).